The biggest frustrations consumers have with the borrowing process is the paperwork, the transparency of the process and the time it takes to get the money they want. At most traditional financial institutions, the whole process is overwhelming, painful and slow. It’s clear that the traditional consumer borrowing process leaves a lot to be desired in terms of borrower experience. Digital technology is transforming the consumer loan industry by providing borrowers with greater simplicity, efficiency and transparency. Those organizations that can use digital technology to process applications, deliver decisions and provide funding quickly on the device(s) of choice will win going forward. The convenience of being able to apply with minimal manual inputs, provide and sign documents electronically, at any time, from any device is enticing to potential customers. To enable this efficiency will require a complete digitization of back-office process, however, not just digitizing paper documents. To determine the potential of digital lending and the strategies being used to simplify the overall loan process, we conducted research of financial institutions globally. In addition, we looked for additional insights from other sources, found industry case studies and looked at the competitive playing field to help organizations be better positioned for the future changes in the consumer lending ecosystem. We would like to thank the CRIF Lending Solutions, who sponsored this most recent global research on digital lending. Their partnership has enabled us to create benchmarking of the expansion of digital lending solutions in banking and to better understand the impact on the consumer. As more organizations are seeking to provide simplified borrowing and improve the consumer loan experience, this research provides a roadmap for implementation and for setting key performance indicators (KPIs). 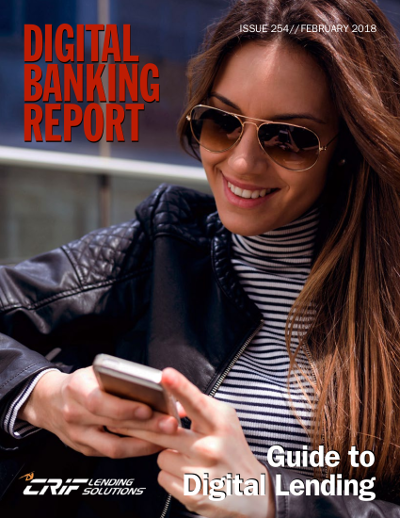 More importantly, we hope that banks and credit unions will use the insight in this report to take action on developing improved digital lending solutions that will resonate in an increasingly crowded marketplace.